Student flats in Sandyford are ideal for those students that want to live a bit closer to the city centre. It is the perfect area if you’re looking for a property with slightly cheaper rent, the surrounding shops, cafes and bars are also accommodating to this. Living in Sandyford is a short walk to both main universities, meaning you’ll never be late for a lecture or have to worry about how you will get home from a late night at the library. Sandyford is a well-established area suitable for both young professionals and students with the rent being a little cheaper than Jesmond. 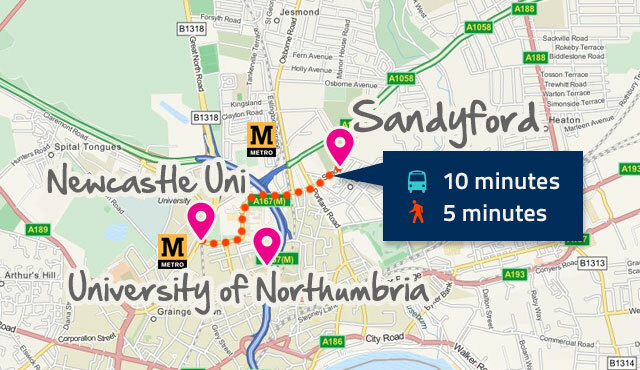 Also easily reached on foot from Sandyford are Jesmond and Heaton, both within a short proximity from Sandyford you’ll never run out of places to go for food and drinks (take a look at our range of student properties in Jesmond and Heaton). Located at the bottom of Springbank Rd, this is a traditional style pub which was recently opened at a classy location for students. The Bluebell has one of the best beer gardens in the city, perfect for enjoying a cold drink in sunny evenings after a day of lectures. It also offers both home cooked food and you can also have the pleasure of trying out the weekly pub quiz. If you feel like leaving Sandyford for a few more drinks somewhere else, then Osborne Rd in Jesmond is only a short walk away. A great little Italian eatery, serving breakfast, lunch, dinner and also great coffee. Situated on Helmsley Rd. This cafe offers all the Italian classics and much more. Coffee house and drinks bar with the odd splash of live music. You can either come here for a light lunch or experience the full menu for dinner which take inspiration from across the globe. Sandyford’s traditional Italian eatery with the menu not just for pizzas and pastas. With ingredients brought over from Italy to give that authentic feel.